Work with your local building department and installer to make sure you have any Historical Commission sign offs before the project is scheduled to start. The lease was designed to be cost neutral for the 10 year term. After the church owns the array, we expect to save about $70,000 over the 30 year life of the system. 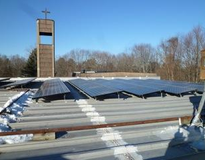 Two arrays of panels, one on the pitched roof and one on the flat roof over our parish buildings. 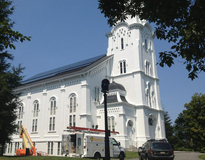 We are NOT installing any solar on the slate roof of our historic H. H. Richardson sanctuary. We hope it will be an inspiration to our community and encourage everyone to do more to care for creation. We have a 10 year maintenance contract built into the lease. We have upgraded a lot of our lighting to LED and high efficiency florescent fixtures. We also completed a conversion from dirty oil boilers to high-efficiency condensing natural gas boilers and added additional insulation in our sanctuary. We are all called to care for creation and as a pillar in the community we have to demonstrate by example and do what is right. Don't give up when you run into hurdles. It took us about 3 years to make this a reality, but it is well worth the effort. We had to scale back the system due to the utility infrastructure. The original design called for 35 kW, but we had to reduce that to 25 kW to get our utility interconnection. 25 kW is a whole lot better than 0 kW. October 5, 2013 from 10am-1pm Parking is in the rear of the church.